Our buds at Biltwell are no strangers to riding the Sierras and they've helped us make some route maps of the various rides they find to be the most scenic. We will have maps for each route at the merch booth. They are FREE so grab a few and enjoy these scenic routes. Need gas before you head out? No problem, our exit for camp has a gas station. For those of you who like to see and plan, click the maps below to access the pertinent particulars aka a step by step google maps and enjoy! Recommend to stop at the Lakeshore Resort for some fish tacos and a cold one on their back deck that overlooks the lake. Rider be aware: It's summer so expect some delays and road work around Lake Tahoe but the views are so killer you won't mind stopping to enjoy it. Park and dip! You can easily find your own private place to take a dip along this route. Hungover? Do this one! Mellow rip that makes you feel like you got out there and did something for the day + epic views and one hell of a bridge crossing. Make sure to stop in Sierra City or Downieville for some lunch and a dip! These spots have everything and are the essential "small town" places that make the area so uniqe. If you really want to get your freedom on, click HERE for the ride back that goes up through Donner Pass. The bridge is N U T S and it's a motorcyclists idea of heaven. If you rather hit the freeway and save 15 min, click HERE, but please note you are BLOWING IT if so! The fun way only adds 15 min extra to your ride and you get one HELL of a view of Donner Lake with switch backs galore ENJOY! None of these suit your fancy? You are on your own :) There are thousands of watering holes, cool towns, river access spots etc. Simply give the area a google and plan your own adventure. For those of you who party too hard and feel like human trash on Sat, we have river access at camp that you can easily access. Everyone is more than welcome to chill on site during the day but you'll be on your own for lunch as the site turns into a ghost town while everyone is out enjoying the routes. An overview from last year. 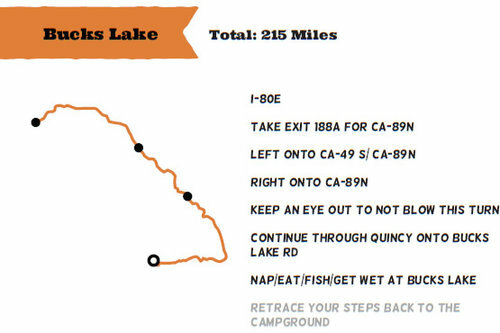 Ignore the date, we simply wanted to show you what each route looks like from camp.